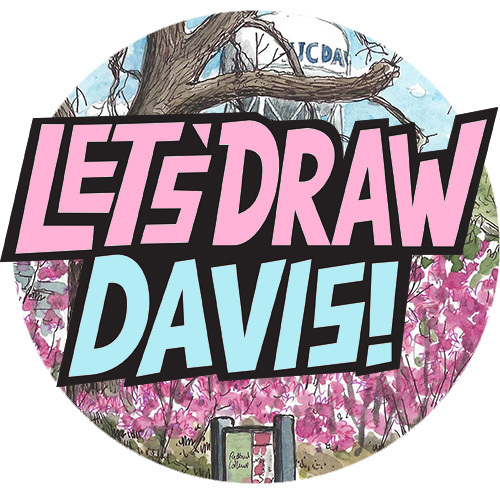 It’s a good job my trip to San Francisco at the end of March was only an overnighter, otherwise I may be posting sketches for the next couple of years. 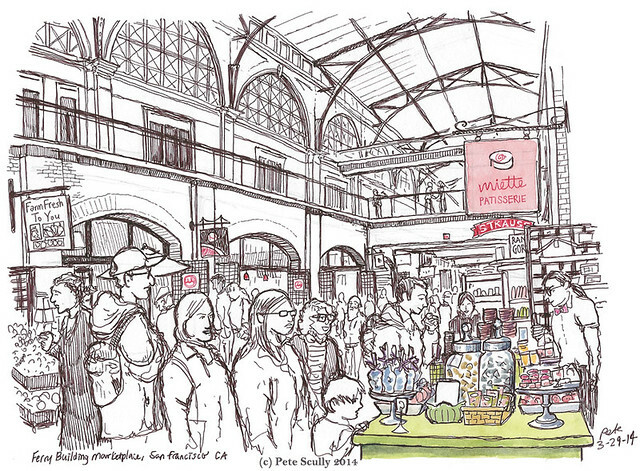 Here is another, sketched on the Saturday morning at the Ferry Building market. After the previous day’s sketches of North Beach I had gotten a pretty decent night’s sleep. When I woke up however the heavens had quite literally opened up. Well when I mean quite literally I don’t mean there were angels and harps falling from the sky, but that would have been less torrential than the rain which came down. It was magnificently otherwordly rain, which as you know is not particularly common here (and this epic downpour was more than needed for drought-threatened California). In the half-block from the hotel to the crosswalk I was drenched through. I retreated and reorganized. Now I love the rain, and yes it does make sketching a lot more limiting in terms of where I can stand. I had really wanted to sketch the Farmer’s Market over at the Ferry Building though, and wanted to be outside. No problem of course, I can always find a good spot! Not this time. Everywhere outside was a rainy blur, and every bit of shelter with a decent view seemed to be leaking. And then I remembered – oh yeah, the interior, I’ve never sketched inside the Ferry Building itself, never attempted that lovely roof. I had one of my favourite cannolis from the little cannoli and doughnut stand, and perched up beside a colourful patisserie to sketch the scene. I kept the colour to a minimum as it made it stand out more. I had spent a lot of time rain-dodging, and then searching in vain for the perfect spot, that by the time I drew this and was done it was already the early afternoon. The idea was that I would sketch some more of the City before heading home, but it was so rainy that I just took a bus up to the Haight.